Are you a seasoned carpenter or just someone passionate about carpentry? Whichever the case, the best hand planer is a must have tool in your kit. These appliances retail in distinct shapes and can execute a variety of tasks. In the past, they were widely used only for woodworking and construction jobs. Nowadays, however, they have become popular among beginners. Even those who’re just diving into the realm of woodworking. As I just said, you can execute lots of tasks with the best hand planer. For starters, you can easily and quickly recover old lumber. You can quickly do this by removing the discolored wood surface and smoothing out all torn out edges. This advantage alone can save you lots of cash in the long run. Better yet, these tools are extremely lightweight. This implies you can quickly climb a ladder with it and work on tough to reach areas. I also understand that this may be your first time checking out the best hand planers. With that in mind, I have also included informative sections that’ll prepare you to ensure you only choose the best. The buying guide, in particular, will come in handy when you start picking the best appliance from my list. But let us start by defining what a hand planer is. In a nutshell, a hand planer is a woodworking tool designed to flatten pieces of woods. They’re also effective at reducing their thickness. A hand planer works on the wood like a razor. That is it cuts thick chips or strips from the surface of the lumber. You can also use the tools to level or cut chamfering edges and incise grooves. This usage depends on your needs and the specifications of the hand planer. The most common hand planers come with a wooden or metal sole in which the blades called irons are housed. The blades themselves come in an array of sizes and shapes. The depth of the blades is also adjustable through the use of a knob on the planer. This feature makes it possible for you to remove less or more wood with each passage. Other kinds of hand planers boast different designs but offer the same service. That is thinning and evening out a piece of wood. Manual hand planers are operated by your own force. As you may have thought, they are also the oldest type of manual hand planers. This type of hand planer is also divided into lots of subcategories that it’s almost impossible to list them all together. However, regardless of their long list of types, all manual planers are made of either metal, hardwood, or both. Allow me to point out the three main types of manual planers. Scrub planers: these are relatively small manual planers equipped with thick blades in order to reduce the size of wood pieces effectively. Bench planers: this subcategory comprises jack, jointer, smoothing, and fore planers. They’re utilized to smoothen, straighten, and cut wood. Specialized Planers: this type is designed to decorate shapes, moldings, curves, and cut grooves. The power (or electric) hand planers are tools suitable for heavy-duty assignments. They can either be cordless or corded. An electric planer can deal with all sorts of lumber. Even better, it can smoothen, shape, and plane surfaces that usually cannot be worked on manually. This saves you time and the hassle. In regards to style, electric hand planers are either curved or straight. Curved base planers: These are specialty tools designed to shape curved or arched structure. They are also majorly used in the timber industry and log home building. Straight base planers: These types have a simple design and anyone can use them. Even beginners. They serve to level, smooth, shape, cut, or pane all kinds of surfaces. Such surfaces include furniture, frames, doors, as well as rough boards and wood planks. Note that this guide will focus more on electric hand planers because they’re more efficient. They offer the advantage of precision. Detailed work and fine carving such as decorative works and building of musical instruments need more control over a tool. And that is achievable through hand planers. They work at all times. If you chose a manual planer, it will work at all times. It needs no fuel, power, or air pressure. They are smaller and more compact in nature which saves space in your garage. This feature makes these power tools lighter and easier to carry as well. The main disadvantage of hand planers is the fact it will take a bit more time to complete simple tasks. The second disadvantage of hand planers is the fact one will need more skill to operate the tools. Making a straight, and clean cut using a handsaw is way difficult compared to if you were using a tool, such as a table saw. Table saws also boast a higher cutting speed. 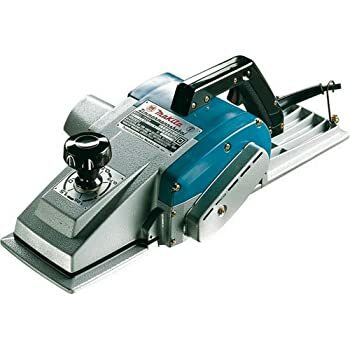 At this point, I hope you’ve gone through all the preceding sections and have made up your mind that you’re going to acquire an electric hand planer. If that is the case, then there are several factors you should consider when choosing the best one. Electric hand planers are powered by their motors. This means that the more powerful the motor, the more accurate and efficient the planer will be. However, also note that the more powerful the motor, the higher the price you will have to pay for the hand planer. If you are looking for a tool you can use at home as a new woodworking aficionado, the 6 amp, and 5 amp hand planers will be just fine for your needs. That said, if you intend to tackle bigger tasks. Then you’ll need a product that is a bit more powerful. Which brings me to the second factor! The hand planer’s cutting blades determine the amount of wood you’ll cut with every pass. For heavy duty tasks, I recommend carbide blades because they are more durable and efficient. Besides the motor power and cutting blades, basic tools that come with the hand planer are likewise important. The fence/guide included in the planer should be nicely assessed prior to purchasing the product. This is because a better fence means better control. Other tools that come with hand planers include angled guides, rabbeting, and dust control accessories. Both wooden and metal bodied hand planers have their pros and cons. Metal bodies are quite heavier than their wooden counterparts. On the other hand, they are way more water resistant. This is particularly true when you’re working with abrasive woods. The wooden ones are more advantageous if you’ll be working for long periods. Generally, though, I urge you to consider only metal ones as they’re also more durable. The Makita XPK01Z takes the first spot in my enumeration of the best electric hand planers. This tool combines the speed of a corded electric planer with the convenience of a cordless one. This implies that you receive an efficient and fast working cordless hand planer that planes lumber like a dream. This product model is also one of the 18V series offered by the reputed manufacturer of power tools. And that’s none other than Makita. This hard to beat product is powered by the 18V Lithium-Ion battery. This is, in fact, an added advantage. Makita’s Lithium-Ion battery charges pretty quickly and lasts longer while working on your projects. All power tools from Makita are exceptionally quiet. The Makita XPK01 is no exception. 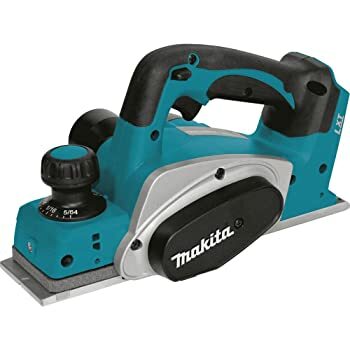 Here comes a second planer from Makita. This should prove that power tools from Makita do need your attention. The Makita 1806B is an electric hand planer designed for seasoned carpenters in search of precision. It retails with razor-sharp dual blades. These provide planning accuracy on woods of all kind. The planer also boasts a powerful 10.9 Amp motor that spins at 15,000 rotations per minute. This generous cutting capacity permits the tool to provide flawless and fast results. As long as the lumber surface is up to 1/16 inches deep and 6-3/4 inches wide, the Makita 1806B is your go-to product. Can work on heavy-duty projects thanks to its powerful 10.9 AMP motor. 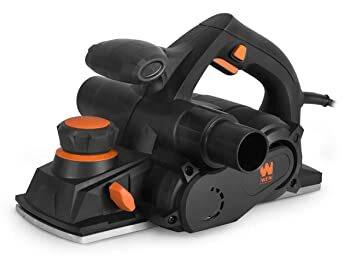 The WEN 6534 electric hand planer is the best one for a hobbyist who would like to become a professional one day. This product also brings the utmost value for money. Efficient and fast, this masterpiece retails with a powerful 8-Amp motor. It is also characterized by its adjustable cutting depth with approximately 16 stops and a range from zero to 1/8. You can direct the discharge of the shavings to a side of your liking, either to the left or right. The Bosch PL2632K 3-1/4 comes with a 6.5 Amp motor which produces approximately 16,500 rotations per minute. This rpm delivers smooth finishes and fast stock removal. According to online reviews from previous customers, the motor’s 6.5 Amp power makes the appliance the best option when it comes to trimming doors. In addition, the rear shoes and the aluminum front are precision-machined together to ensure accuracy. For efficient chamfering, Bosch further included a machined groove. Also equipped with 2 reversible Bosch Woodrazor carbide blades, Bosch PL2632K 3-1/4 boasts a two blade system. This permits it to accommodate high-speed steel blades and other accessories you may require. The tool also comes with a spring-loaded stand. This feature elevates the planer in order to protect its blade and the tool’s resting spot. 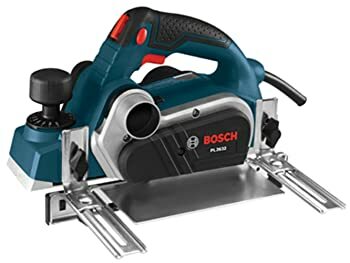 Since I discovered the Bosch PL2632K 3-1/4, it has made my woodworking projects easier and more efficient. 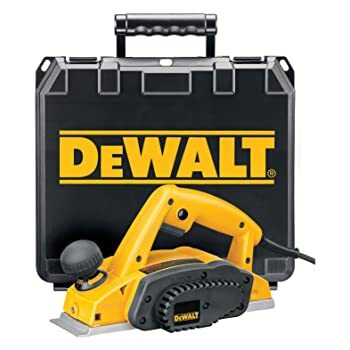 The next appliance that makes its way into my list of the best hand planers is the DeWalt DW680K. The good news is, the brand DEWALT does not need an introduction. Better yet, its products retail with the promise of reliability and high quality. The DeWalt DW680K retails with a 7 amp motor which delivers 15,000 rotations per minute. That is impressive even if you regularly work on heavy-duty projects. The adjustable carbide blades that retail with the DeWalt DW680K are also great. They’re exceptional when it comes to smoothing and re-sharpening battered frames and edges. This masterpiece is easy to use. Its two finger trigger also decreases exhaustion caused by extended usage. Maybe carpentry is your profession or just something you do as a hobby. Either way, your workshop is incomplete without one of these best hand planers. Furthermore, I hope my review was useful. I hope you can now make a well-informed decision and choose a product that meets your needs. Just make sure to stick with branded products when making your choice.